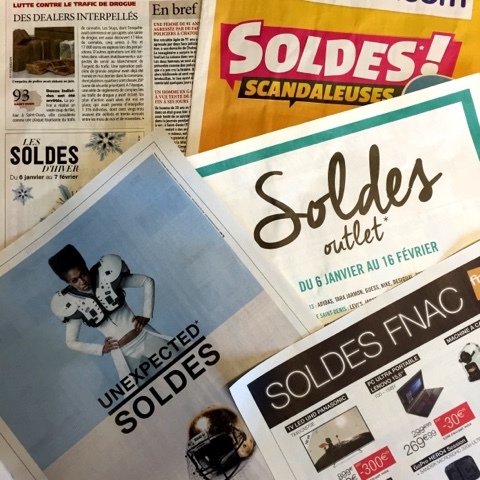 THE WINTER SALES ie "les soldes" will officially begin at 8am, Wednesday 6th January. So brace yourself for exactly 6 weeks of markdowns and price slashes throughout the month and up until Tuesday the 16th February 2016. Major "soldes" are big thing in France because French laws tightly regulate when stores can and cannot heavily reduce their prices. I'm assuming it was put in place to protect businesses so that the big stores couldn't drive out the smaller ones with their power to discount whenever they wanted, all year round. This way, all stores are treated the same at least regarding the time frame they are allowed to be on sale, regardless of their capacity to slash their prices. According to French law, the Winter sales in January/February and the Summer sales in June/July are the only two periods stores are legally able to "go on sale" to clear stock, selling below cost price. Other special guidelines set out by the French commercial code include: stock must have been in store for at least a month before they go on sale (to avoid bringing in cheap stock to sell during the sales), sale and non-sale stock must be clearly marked and separated (to prevent misleading advertising) and, the original price must be visible to consumers. One thing for sure is that we can expect more competition between retailers during les soldes this Winter as they try and clear their stock after the sales slump that followed the November 13th Paris terrorist attacks. Department stores, stand alone stores, shopping centres, boutiques, outlets, e-commerce websites, everything you can think of across France will be on sale. * French sizing and French children sizing in particular tend to be smaller than US/Australian sizing, keep that in mind when shopping for the little ones as they will grow out of your purchase even faster than usual! * If you are purchasing higher priced items, check if stores offer any further discounts - I know at BHV Marais, I was given a 10% discount on the spot just for flashing my Australian passport, no VAT forms nor waiting period required! * Enjoy yourself and happy bargain hunting..! Great article. Some very useful tips. My pleasure! There should be enough (free) parking there normally, however depending on the day/sale period it might be harder (I went to Marques Avenue this weekend and parking that was normally sufficient was a little ridiculous - we ended up parking on the street and walking to the car park). Personally I would try with a car, as the hassle you go through at the beginning pays off at the end when you are tired! From the summer soldes, I've learned the hard way that I should dress lightly and bring some water, haha. Haha, yes - but not too much water, just enough to prevent dehydration, too much and I would need to search for a loo! Hi Nhan , are there any summer sales at the outlet malls currently? From reviews that I hv read online it seems like the outlet malls don't offer great price reductions, unless on sales...is it worth going so far just to shop at the outlets? Sorry for the delay in reply! Unfortunately France has very strict rules about sales - they are only allowed to have two big sales in January (post Christmas) and then in June (I think it starts 24th of June this year). Not sure if you'll be in Paris then to make a trip there? Outlet shopping really depends on your time. Sometimes I go and I will find a good bargain, other times it's not worth the trek out. It can be a bit hit and miss but you can allocate 2 hours there and see for yourself. If you get up early and be there as soon as the shops open then it shouldn't eat into too much of your time!